How do you get children to eat more vegetables? 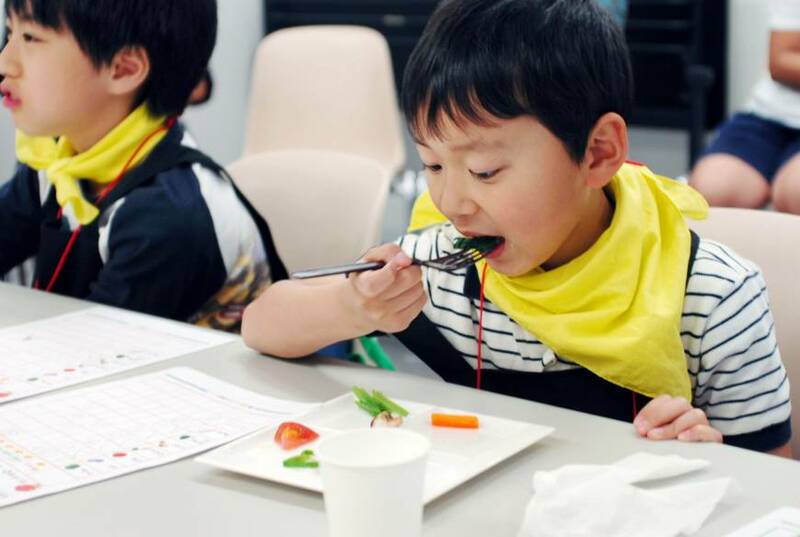 The Japan Vegetable Sommelier Association organized courses in Tokyo recently for youngsters aged 5 to 9 in which trained chefs tried to help them overcome their yuck instinct. 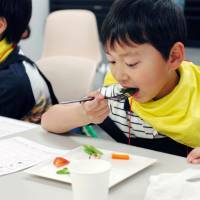 “I’m becoming interested in vegetables,” said participant Takahiro Iwashita, 5, who participated in the program with his mother, Kaori, 38. “I didn’t like green peppers or carrots, but I was able to eat them,” he said. The program comprises 12 classes spread over six months. It costs ¥5,000 a month plus an enrollment fee of ¥10,000. Children study the structure of flowers and seeds and draw pictures of vegetables. They then grow some of the vegetables and learn the route the produce takes from the field to the kitchen via the greengrocer. There are also quizzes and games, including one that involves guessing a vegetable by touch and smell. The association says it is a chance for children to learn while having fun. In each class, instructors cook up dishes aimed to show how to prepare vegetables in way that appeals to children. For instance, green peppers taste less bitter when heated, while tomatoes and eggplants can be easier for children to eat, depending on the way they are cut. Mitsuko Obase, manager of the association, said parents stand to benefit from the course as well. Obase said the association plans to train more vegetable sommeliers as tutors so they can launch more classes in cities across Japan. Meanwhile, food and beverage maker Kagome Co. published 16 recipes in April suggesting ways to juice vegetables and fruits at home and to blend them with its juice products. A smoothie that mixes yellow pepper and kiwi with Kagome’s mango-flavored juice is described as rich in vitamin C, while a green smoothie can be produced by mixing “komatsunam,” a leafy vegetable, into its tomato-based high-lycopene fruit juice. To promote these recipes, Kagome organizes juicing workshops for parents and children. A 38-year-old housewife who took part in one the company’s sessions recently at the LaLaport Toyosu shopping complex in Tokyo’s Koto Ward with her 8-year-old daughter said it was a revelation. Kagome explained that children can easily make tasty smoothies for themselves as its vegetable juice is already flavored. “We hope that children can become familiar with vegetables through this experience of making juice by themselves,” Uenohori said.